If that notepad makes you nervous about using it for random scribbles, maybe you’ll have to use it for Bible study notes. That would be fitting! By the way, whenever I’ve attended government protestant church (Three Self or whatever it is), most of the people dig out rumpled notebooks and pens and diligently take notes during the three sermons. They prop the notepads on the tiny flat board on the top of the pew in front of them, hunched over in the cramped space. Have you seen this? On the other hand, some people use that space for a quick nap. It doesn’t make me nervous, exactly, it just feels weird. I’m Catholic, not protestant, and I’ve only been to protestant churches a few times, but I’ve never witnessed any note-taking during the sermons. The words 福音 (Gospel i.e. good news/tidings etc) are in quite common use in written and spoken Chinese without too much religious connotation. You can see it in many standard newspaper articles about any good new service or happening as well as ads for things like medicine and health products, i.e. good news for sufferers of constipation – Ratsopurge will 通便润肠。There are also a wide variety of Gospel brand products out there (Google it). What is interesting is that they have thought of an English brand for their notebook and then given it a transliterated ‘Chinese’ brand name, which I assume makes it sound more sophisticated to Chinese consumers. Although usage of the word 福音 in the mainland does generally appear to be secular (no problem using it in State press and media), I do suspect that you will find more use of the word as a brand or company name among Taiwanese and Hong Kong companies (due to the religious beliefs of their founders – I have seen a number of Taiwan-based 福音 immigration services and the likes). The additional words Faith and Committed also tend to suggest that there may indeed be a religious connection to John’s notebook. (what other stuff is the factory printing?) 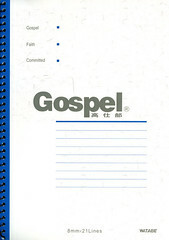 Finally, although the English word Gospel is translated into Chinese as 福音， the Chinese word is not exclusive to the Christian faith and is also used by other religions. the gospel of john… woah. head rush. John, it’s natural that since you’re Catholic you haven’t been hanging out a lot at the Protestant churches, but I was so curious to know if anyone else had seen this degree of note-taking that I decided to ask anyway. You might be interested to know that when I was in Xiamen last April I came across a Jehovah’s Witness store (well, I don’t think it was officially sponsored, but that was the gist of the storefront name). I bought a notebook from there so I could scribble down my travel notes. Actually, I shouldn’t lie…I bought a notebook from there because it was covered in non-sensical Christian writing, and I thought given its Chinese original that gave it significant novelty value. for anyone who hasn’t, be sure to click on john’s links for “chinglish” and “engrish” — very interesting!